Syrian hamsters have a broad head with large eyes and erect ears which makes them resemble to some extent a teddy bear, hence they are also sometimes referred to as teddy bear hamsters. They have stockily built, wide bodies and their best known characteristic is their cheek pouches, in which they collect their food. These extend for some way down the side of their bodies and it can be surprising how much material they can store in them. 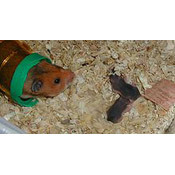 Syrian hamsters live a solitary life and will only tolerate each only when they have to, such as to mate and to help with rearing the young. Young Syrian hamsters will get along fine for the first few weeks, but when they get to about 6 weeks they will start to fight very aggressively and have to be separated. It makes no difference if they are male or female, Syrian hamsters must be kept in separate cages. Syrian hamsters mark their territory with scent from glands located on their flanks and they have very poor eye sight and rely largely on smell to recognise things. 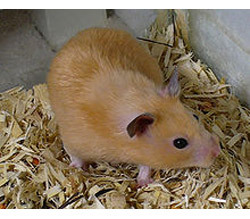 Female Syrian hamsters can reproduce from as early as 5 weeks old, but this is too young and can actually harm them, it is better not to let them breed until the female is about 4 months old. They can mate roughly every 4 days and you can tell when they are receptive by stroking their back and if she raises her tail, then she can be placed with a male that night. 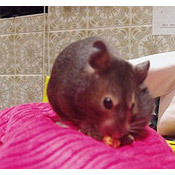 The male and female Syrian hamsters should be introduced cautiously, on neutral territory and with the female entering the area first.